According to "Entertainment Weekly," FX's has announced the premier date of the hotly anticipated fourth season of the best creepfest around "American Horror Story," along with an 11 second teaser trailer! 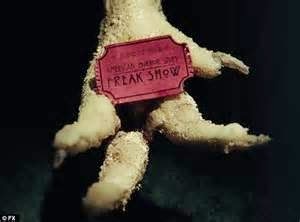 Be sure to clear your calendar for Wednesday, Oct. 8 at 10 p.m. -- that's when the freak show is coming to town! "AHS: Freak Show" stars many familiar faces from Horror Story's past, including Jessica Lange, Kathy Bates, Sarah Paulsen and Angela Bassett.